Fine art, Illustration, graphic design and the art philanthropy of Sam Morrison: Geocaching Possibilities?? Last week I was listening to a "This Week in Tech" podcast when the host interviewed an indivdual involved in something called geocaching (pronounced geo-cashing). 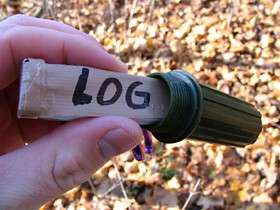 Geocaching involves people hiding containers of various sizes in public places. The contents of the containers vary by the individual. Most often they include a log book (for finders to sign and date) and trinkets of little value (super balls, key chains etc.) 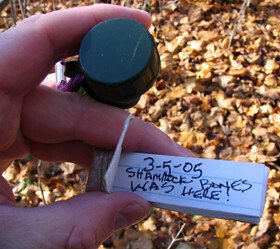 When an individual hides their container (cache) they mark the location with their GPS (Global Positioning System) unit. 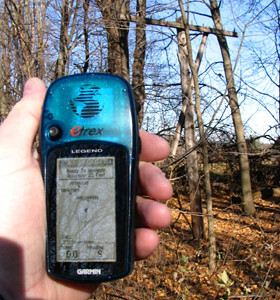 Then they go home and log onto geocaching.com and enter their GPS coordinates. The coordinates are then made public online. From there anyone with a GPS receiver and a sense of adventure can set about to find the cache(s). Intrigued by the concept and podcast interview I went to geocaching.com and entered my zip code (49097) to see if there were any caches nearby. Keep in mind, I'm thinking this is some small scale hobby and the chance of Vicskburg having any caches nearby would be slim to none. Was I wrong! 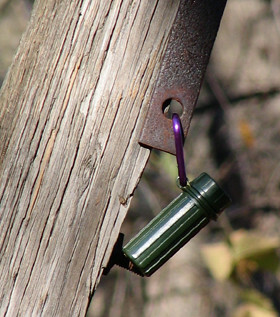 There's caches all over the place! At that moment I realized I had to get a GPS unit and see what this hobby (or sport to some) was all about. If it was as interesting as it seemed, the potential to combine my public art projects and GPS coordinates opens up some interesting possibilities. Even though I was still struggling to learn the ins and outs of my GPS unit I managed to find a (nano) cache with minimal difficulty (less than 2 miles from my house). The container was found on a bike trail, hanging from an old power pole. Inside the container was a log book (which I signed and dated). Kinda cool for a first find. What was even better was, the bike trail I was on had at least 4 more caches to be found. I'll be posting photos as I find those.